Arthur Linfoot refers to “British troops in Antwerp” in his diary entries for Saturday 3 October 1914 and during the ensuing week. The record left by Leading Seaman Hawes throws further light on British participation in the defence of Antwerp during these few days. Arthur James Godball Hawes had been a member of the Naval Reserve before World War 1, and was sent as a Leading Seaman in B Company, Hawke Battalion, Royal Naval Division, to assist in the defence of Antwerp in October 1914 (his 20th birthday was on 18 September, 1914.) In November 1914 he wrote a manuscript record of the eight days Sunday 4 October to Sunday 11 October inclusive. This record is written in a small notebook (16cm x 10cm), with Notitieboekje printed on the cover, which is now in the ownership of his niece Cynthia Hawes. 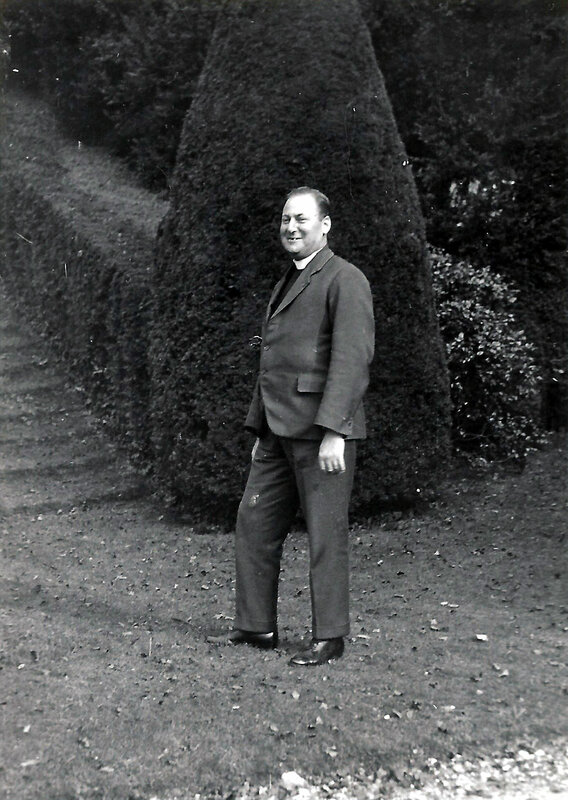 Arthur Hawes’ narrative has never been published, and is made available now, in the centenary year, by kind permission of Miss Hawes, who reserves all rights of ownership and publication. 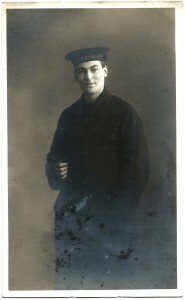 Two postcard-sized photographs of Arthur Hawes in uniform have been preserved with his notebook, and are also reproduced here with Miss Hawes’ permission. 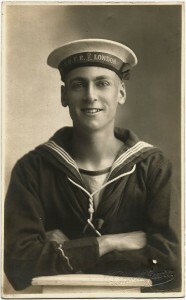 One (above) is presumably a pre-War portrait, as the hat bears the lettering “RNVR London”, while the other photo (left) has only “RNVR” on the hat (names of ships and bases were removed in war-time for security reasons.) The photographer’s details: F. Russell Jewry, 69a High Street, Deal, are on the back of the pre-War photo, and three addresses of the Curzon Studios are on the back of the other one: 115 The Grove, Stratford E; 224 High Road, Kilburn, N.W. ; 19 Hill Street, Richmond, S.W. Arthur Hawes’ occupation before WW1 is not known (he was not quite 20 at the outbreak), but after the War he attended King’s College, London, and entered the Anglican Ministry. 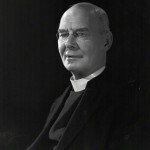 At the start of World War 2 he held office in St. George’s Cathedral in Jerusalem, was Dean of St. George’s College, and remained there perforce until 1945; in 1946 he was appointed vicar of All Saints, Fulham, and was Rural Dean of Fulham, Examining Chaplain to the Bishop of London, and a Prebendary of St. Paul’s. He died in office in June 1965. The remaining photographs of him shown here are dated 1933.
exists in the collection of the National Portrait Gallery. This set is dated January 1947 – Dr. Hawes would have been 52 years of age at that time. 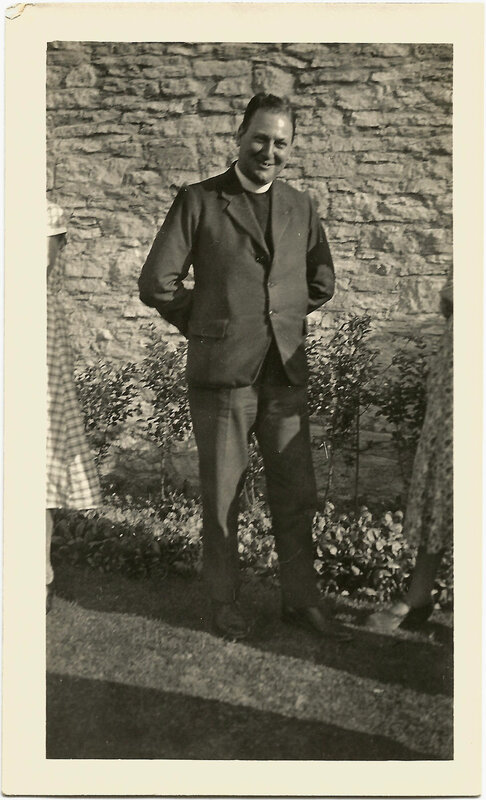 It is entitled “Arthur James Godball Hawes (1894-1965), Rural Dean of Fulham” and was donated to the National Portrait Gallery by Bassano & Vandyk Studios in 1974. The image to the right is the property of the National Portrait Gallery and is used here with permission under a Creative Commons license. Hawke Battalion was one of eight Royal Naval Reserve battalions sent to the defence of Antwerp; another was the Anson Battalion, in which the poet Rupert Brooke, perhaps best known for his poem The Soldier (“If I should die, think only this of me . . .”) was a lieutenant. In an edition: “The Collected Poems of Rupert Brooke: with a Memoir”, first published by Sidgwick & Jackson in July 1918 and many times reprinted, Rupert Brooke’s mother, Mary Ruth Brooke, in her long Memoir on Rupert’s life and service, quotes extensively from his letters and conversation about the Antwerp expedition; much of his description and impressions, about the journeys, the destruction of Antwerp, and the refugees on the roads, is strikingly similar to Arthur Hawes’ account of these events and sights, and makes an interesting comparison. The Anson Battalion was one of those which avoided internment in Holland, and unlike Arthur Hawes, Rupert Brooke was able to tell his family and friends at first hand about his Antwerp experience; his return to England also enabled him to be posted to the Gallipoli enterprise early in 1915, where he died (at Scyros) in April 1915.